I love jewelry blog hops as they nudge me to expand my range. I don't however usually end up with two on one day. I struggled with just how I was going to show off them both and finally decided to do just one post and to put them in the order that I signed up for them. So warning, this is going to be a longer post. This was a fun challenge where Skye of Creative Chaos sent out four little bags of goodies to four of us to use in a design. Here is a pic of what she sent us. Now be sure to check out what everyone else came up with. Now this one was my surprise hop. 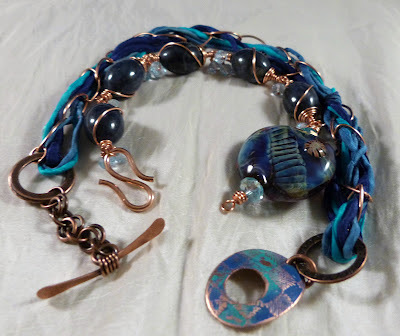 Lori Anderson of Pretty Things has a blog challenge that occurs a few times a year where she stretches her wings by working with designers of some wonderful handmade beads and invites a few of us to take the journey with her. 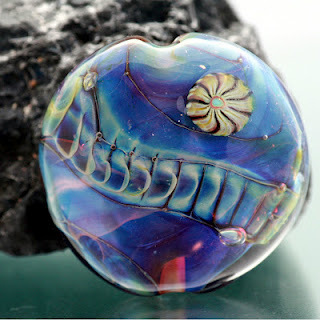 The designer of the gorgeous lampwork focal bead is Lea Avroch and I will be sharing her various sites where you can see more of her work down below. This is the fabulous bead that I started out with. And I had plans on making it into a necklace and so I did. But once I had to together, I found that it was just too fussy and didn't highlight this treasure. So I changed plans and actually finished it up a couple days ago. I decided that I wanted to make a bracelet so that I could actually see and admire the bead. I ended up with two bracelets that can be worn together and apart. 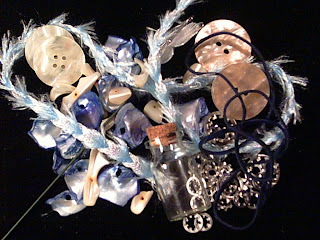 Along with the focal from Lea, I also used sapphires and faceted blue topaz. It only seems fitting to use a precious gemstone with this treasure. I picked up the sapphires at Magpie Gemstones which I highly recommend. The clasp on the second bracelet is from AZ Lampwork Beads. Now be sure to check out what the other participants came up with. 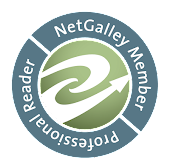 To be able to see more of Lea's work please visit her sites. And for more information on upcoming Cup Of Bead Soup hops and to check out the past ones, click here. 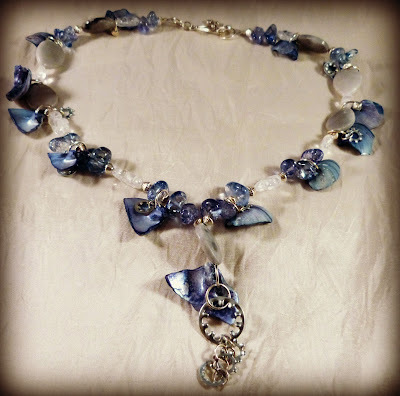 Beautiful work on both challenges - I love your mother-of-pearl necklace, it's a great idea to use the shells in small clusters. And the Cup of Soup - gorgeous! The sapphires are beautiful; I love the wrapping... and the 2nd bracelets - they look so yummy together! Absolutely goregous work Shaiha. The necklace is a delight, but I am in awe of your bracelets. The saphires are prefect with the focal and the second bracelet compliments them so well. Love the clasp! I love how you balanced the weight of the lampwork bead -- and glad you used precious gemstones, too! The Chaos piece is really cool, too! Love your work on both challenges. The jewel blues in the bracelet are beautiful and so eye catching. Great job on both! That is beautiful, the sapphires work well and I love the toggle that is so special! The bracelet is genius though! I enjoy how you created a two-in-one kinda thing! You certainly are adventurous, working on 2 challenges at once. I can barely walk & chew gum at the same time. lol! Though now I see that you had help with the necklace. Your friend's daughter definitely shows great promise! I love, love, love the idea of the 2 bracelets! Brilliant! I've been really loving designs that add some fiber for texture and yours is really lovely. I remember seeing a pic of the toggle when you posted a teaser. Just love it with the bracelet! Great job! Wow! I love what you did with this challenge! The fiber and that clasp are great with that beautiful lampwork bead focal! Wow, two design challenges in the same day. Your chaos piece is really great, she did a wonderful job on it. I really love how you show cased the beautiful glass bead. I am always scared to put such a large bead in a bracelet, but yours is really stunning. Wow, a 13 year old created that gorgeous necklace? Please, tell her to keep designing! Her necklace is beautiful! Love the wire work of your beautiful Lea Avroch bracelet set! Lea's beautiful bead is extraordinary, and the beautiful sapphire bracelet set looks great with it! Love how you've made sophisticated, high end, rich gemstone beads coordinate with a soft, casual, pretty textile design -- the juxtaposed textures become one brilliant, lovely, very cool design!